Phenotype MicroArray Mammalian assays are cell-based assays used to investigate up to 1,400 metabolic and chemical sensitivity phenotypes of mammalian cells. 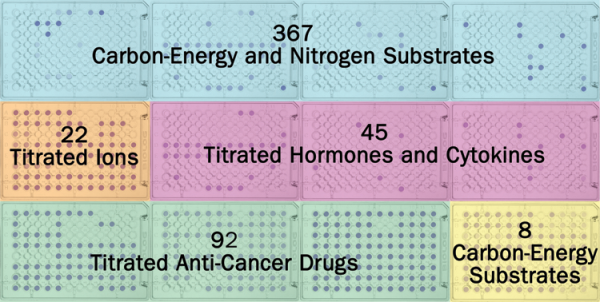 They use 96 well plates pre-loaded with carbon-energy and nitrogen substrates, ions, hormones/cytokines and anti-cancer agents. Plates are inoculated with the cells of interest and Biolog’s proprietary redox dye. In some wells, the cells are stimulated and in other wells inhibited. The generation of energy-rich NADH by the cells reduces the redox dye and brings about a color change which is then read with Biolog’s OmniLog automated incubator-reader. Just as DNA Microarrays and Proteomic Technologies have made it possible to assay the level of thousands of genes or proteins all at once, Phenotype MicroArrays make it possible to quantitatively measure thousands of cellular phenotypes all at once. DNA Microarrays and Proteomic Technologies allow scientists to detect genes or proteins that are coregulated and whose patterns of change correlate with something important such as a disease state. However there is no assurance that these changes are really significant to the cell. Phenotype MicroArrays are a complementary technology providing the needed information at the cellular level. Phenotype MicroArrays use Biolog’s patented redox technology, with cell respiration (NADH production) as a universal reporter. If the phenotype is strongly “positive” in a well, the cells respire actively, reducing a tetrazolium dye and forming a strong color. If it is weakly positive or negative, respiration is slowed or stopped, and less color or no color is formed. 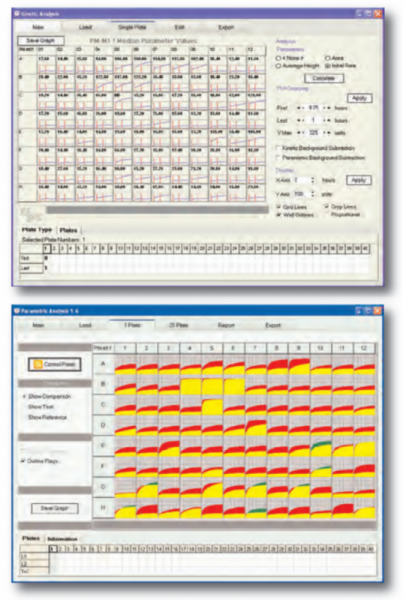 The OmniLog software contains a suite of algorithms that work in conjunction with the OmniLog and the Phenotype MicroArray panels to automate incubation of up to 50 microplates at a user-specified temperature with continuous collection of colorimetric assay data over time. Data analysis programs allow for display of kinetic data, management and analysis of data, and facilitates export in a variety of raw and processed forms. Have a Look at our simple set up video!